The idea that all U.S. hospitals may not be able to safely treat Ebola patients seemed to find more acceptance Monday as a second federal official suggested it was worth rethinking whether to send patients to one of the specialized units set up to deal with dangerous germs. Dr. Anthony Fauci, director of the National Institute of Allergy and Infectious Diseases, said on ABC's "Good Morning America" that requiring that Ebola patients be sent to special "containment" hospitals "is something that should be seriously considered." On Sunday, health officials said that a breach of infection control led to a Dallas nurse getting Ebola, and revealed that even in the United States, with the best conditions and protective gear available, mistakes can happen that expose more people to the deadly virus. The nurse, identified Monday as Nina Pham, was said to have worn full personal protection equipment while caring for Thomas Eric Duncan, a Liberian man who died Wednesday of Ebola at Texas Health Presbyterian Hospital. She doesn't know how she became infected, and officials are investigating to try to find out. How did a nurse in protective gear become infected with Ebola? Of the six Ebola patients treated in the U.S. before the health worker's case, Duncan was the only one not treated at one of the specialized units in four hospitals around the country set up to deal with high-risk germs. The CDC's director, Dr. Thomas Frieden, has said that any U.S. hospital with isolation capabilities can care for an Ebola patient. But his stance seemed to soften on Sunday, when asked at a news conference whether officials now would consider moving Ebola patients to specialized units. "Thinking about what the safest way is to provide that care, that's something that we'll absolutely be looking at," he said. "We're going to look at all opportunities to improve the level of safety and to minimize risk, but we can't let any hospital let its guard down," because Ebola patients could turn up anywhere, and every hospital must be able to quickly isolate and diagnose such cases, Frieden said. CBS News chief medical correspondent Dr. Jon LaPook told "CBS This Morning" that even health care workers who think they're following protocols may be at risk. "This happens especially if you're not specifically trained in how to do this and the Dallas hospital did not do specific training beforehand," he said. "This was a surprise to them and I think supporting the fact that the protocol probably does work if followed correctly is the fact that there are two places -- Emory [in Atlanta] and Nebraska -- where five people who were infected were treated and none of the health care workers there became infected. They do drill all the time there." But Dr. Eileen Farnon, a Temple University doctor who formerly worked at the CDC and led teams investigating past Ebola outbreaks in Africa, says it would be a mistake to assume that moving patients to a specialized unit is always the answer. "It is also a high-risk activity to transfer patients," potentially exposing more people to the virus, she said. Is the government competent enough to handle Ebola and ISIS? Still, there's a big difference between a 40-bed community hospital and a 900-bed hospital like Texas Presbyterian or a big medical center affiliated with a university, said Dr. Dennis Maki, a University of Wisconsin-Madison infectious disease specialist and former head of hospital infection control. "I don't think we should expect that small hospitals take care of Ebola patients. The challenge is formidable," and only large ones truly have enough equipment and manpower to do it right, Maki said. "If we allow it to be taken care of in hospitals that have less than optimal resources, we will promote the spread," he warned. All health workers treating an Ebola patient should wear personal protective gear, the CDC says. The exact gear can vary. A hazardous material-type suit usually includes a gown, two sets of gloves, a face mask, and an eye shield. There are strict protocols for how to use it correctly. "When you put on your garb and you take off your garb, it's a buddy system," with another health worker watching to make sure it's done right, Maki said. In Dallas, the investigation is focusing on two areas: How the garb was removed, and the intensive medical procedures Duncan received, which included kidney dialysis and a breathing machine. Both involve inserting tubes - into blood vessels or an airway. That raises the risk a health worker will have contact with the patient's bodily fluids, which is how Ebola spreads. "Removing the equipment can really be the highest risk. You have to be extremely careful and have somebody watching you to make sure you remember all the steps," Farnon said. "After every step you usually would do hand hygiene," washing your hands with antiseptic or being sprayed with a chlorine spray. Some of the garb the health worker takes off might brush against a surface and contaminate it. New data suggest that even tiny droplets of a patient's body fluids can contain the virus, Maki said. "I can have on the suit and be very careful, but I can pick up some secretions or body fluids on a surface" and spread it that way, he said. The case heightens concern for health workers' safety, and nurses at many hospitals "are alarmed at the inadequate preparation they see," says a statement from Rose Ann DeMoro, executive director of the union, National Nurses United. 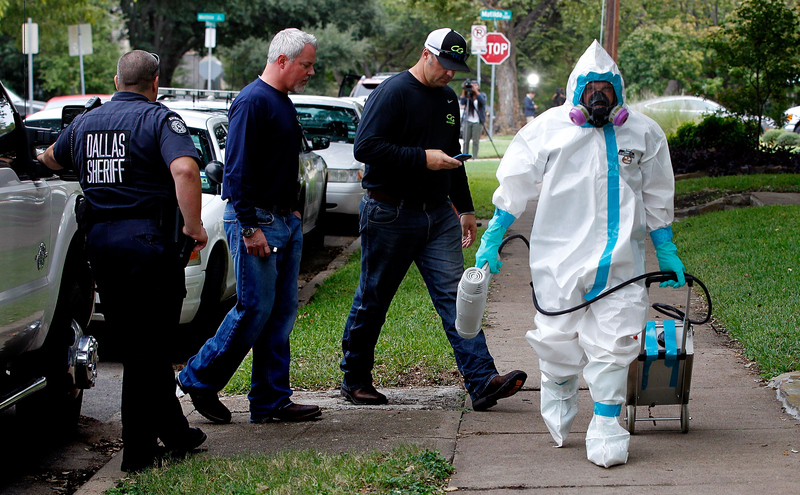 The CDC says training at the Texas hospital has been ramped up. The agency recommends the hospital minimize the number of people caring for an Ebola patient, perform only procedures essential to support the patient's care, and designate a full-time infection control supervisor while any Ebola patient is being cared for. Frieden also said the agency was taking a new look at personal protective equipment, "understanding that there is a balance and putting more on isn't always safer - it may make it harder to provide effective care."